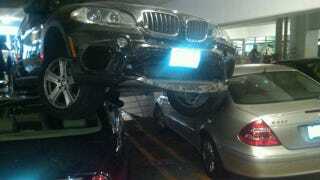 Holy Crap, How Did That BMW Get On Top Of Those Two Cars? The 74-year-old driver of this BMW X5 mashed the gas and plowed through a heavy wire barrier in a Chicago parking garage today, landing on top of a Jaguar and a Mercedes. It appears that BMW crushes its rival luxury carmakers, literally. The man in the BMW was cited for "driving too fast for conditions." It remains unclear if this is why people think BMW drivers are asshats.